If you think getting a tattoo is all about going through the inking process, you need to think again. The process does not end when you walk out of the shop door. You need to be more careful and pay attention to so many things to go through different healing stages. It is important to take the right care of your new body art to ensure it looks great once the healing has completed. Keep reading to learn what to do in different stages. How Many Tattoo Healing Stages Will I Experience? After the placement of pigment, your skin will swell a bit and you will notice some tenderness and hotness around the affected area. The swelling is mainly because your immune system reacts to an increased flow of blood to a particular area. The warmth is also due to the increased blood flow. Your white blood cells will also come to rescue and fight any microbes and other foreign bodies around the area. It is due to this process that getting a fresh tattoo often looks like a sting or sunburn. Avoid picking the scab or it will affect the healing. Wash your tattoo area a couple of times at least with mild soap and water. Apply some mild moisturizing lotion on the affected area. You will notice some tightness in the tattooed area mainly because the protein fiber called collagen will soon grow within the tattoo. This will make the edges of the wound to shrink a bit and close. Small blood vessels will supply blood to the new skin cells. You are likely to experience some itching during this stage because the scabs are formed properly and may even begin to flake off. Itching is also due to the skin around the wound becomes a bit dry. If you experience some peeling, do not worry about it. It is natural and completely normal. Never try to peel off the skin that is flaking off. Do not graze or scratch your tattoo to relieve itching. Make use of moisturizing lotion for relief. Your body continues to add more collage to the tattooed area, which in turn refines it. You will notice almost all of the scabs fall way from your tattoo. You may still notice some dryness and tenderness, but that is normal. Your tattoo has not healed completely at this time. You may notice the tattoo is less vibrant as compared to when you have it finished fresh. 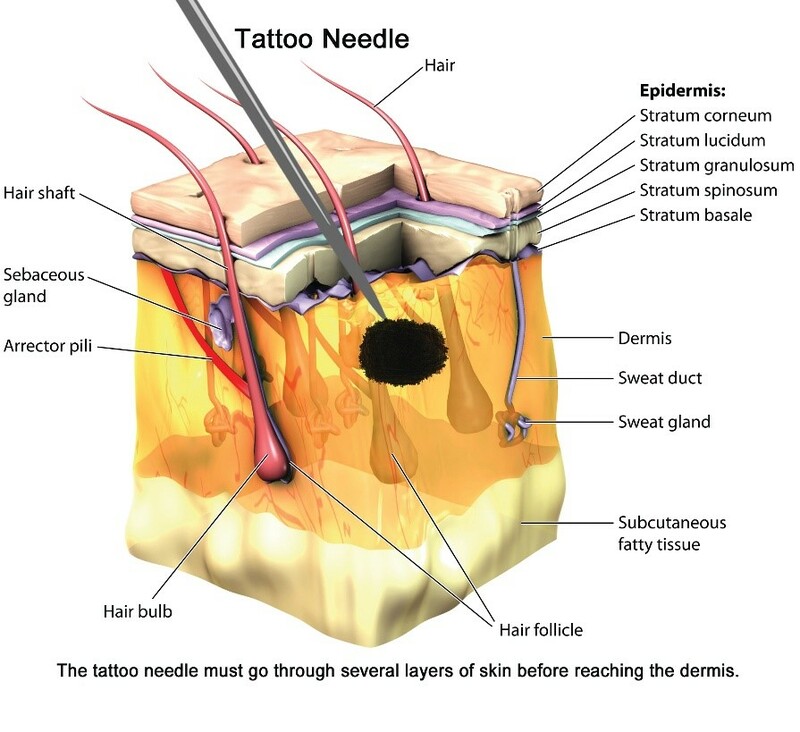 That is mainly because there is still another layer of dead skin that needs to fall off, and that will be the completion of all tattoo healing stages. Protect your healing tattoo from direct sunlight. Avoid swimming if you think your tattoo has not healed completely. Avoid soaking in a tub or it may affect the natural healing process. Never pick, scratch or rub the tattoo. Talk to your doctor if you notice any pain or other symptoms during the healing process. What Slows the Process of Healing? While you have taken serious care during all aforementioned tattoo healing stages, certain things may still hamper the recovery process. The most common issues are dead skin, infections, hemorrhage and mechanical damage. What you eat will also have an impact on how fast the healing is. Similarly, some medical conditions, such as anemia, diabetes and some vascular diseases may also affect the blood flow to the tattooed area and cause slower healing. Other factors affecting the healing process are your age, smoking, varicose veins and dryness. Clean your tattoo area and remove any debris or dirt. Do it gently. Never use balms or creams that cause numbing. Vaccinate for tetanus to avoid any infections. Take antibiotics or use antimicrobial dressings if you notice signs of infections such as pus, pain and fever. Use support stockings or something else as directed by your doctor. Treat other medical condition like anemia to ensure your wound heals quickly. In addition, you should be very careful about what you eat during different tattoo healing stages. You need to provide your body with more vitamin C that helps make collagen. Adding more vegetables and fruit to your diet is a good idea because this will provide you with other nutrients essential for wound healing such as copper, vitamin A and zinc. You can also take some vitamin C supplements to accelerate recovery. Why Are My Feet Peeling?